Pretty Butterfly - sung to "Up On The Housetop"
Makes a chrysalis in a big oak tree. Nothing but chew and chew. "I think I';l take a nap," said he. To spin a chrysalis and he fell asleep. "Wake up, it's time to get out of bed!" Look I'm a butterfly! and he flew away. Cut off the top part of cardboard egg cartons. Then cut the bottom sections in half lengthwise. 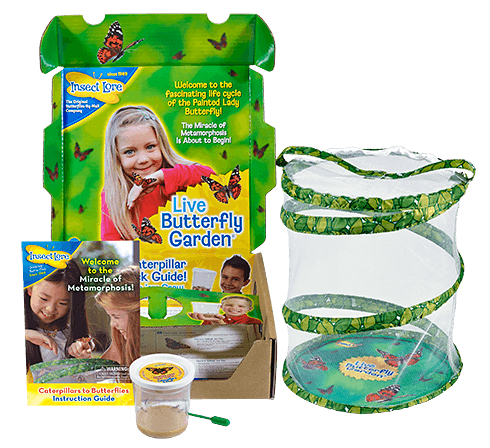 Turn the sections over and have the children paint them green, brown , or orange (or any color if they want) to make caterpillar bodies. Help them poke pipe cleaners into the tops of their caterpillar heads to make antennae. 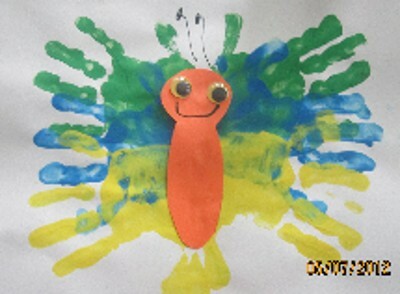 Then have the children draw eyes and mouths on their caterpillars with markers. Cut a large number of 1-inch circles from different colored construction paper. 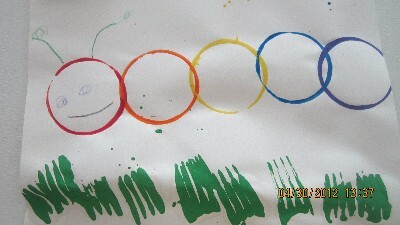 Have the children create caterpillars by gluing the circles together, alternating colors to form patterns. Let them add circle stickers for eyes and construction paper antennae. Horizontally cut egg cartons in half. Place the pieces on the art table with short pieces of pipe cleaners, markers, and crayons. From these materials, the children can make caterpillars. 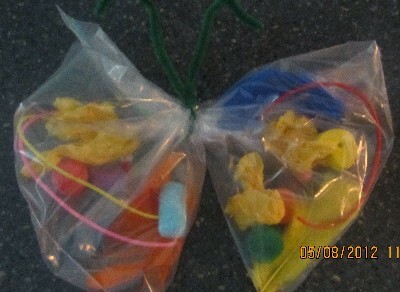 We used gallon sized ziplock baggies and added colorful art supplies we already had on hand. Then we just scrunched up the middle with a green pipe cleaner and bent the ends for antennae and walaaa! A cute butterfly! You will need: Cardboard (or oaktag), felt tip markers, crayons, hole puncher, string. "Let the children trace around Butterfly shapes of different sizes, then design their own patterns on the wings. Cut out the butterflies (traced onto cardboard), punch holes on the wings (or body) and thread a piece of string through the holes. This will create a lovely Butterfly chain to display in the classroom, to which each child has made a contribution. Write the child's name in the butterfly's body." 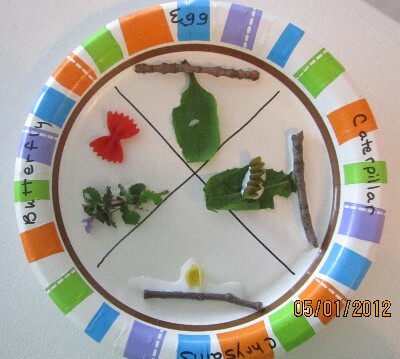 Large paper plate, divide into 4 sections - egg, caterpillar, chrysalis, butterfly. Be creative! We used twigs and small leaves and wildflowers from our backyard. We also used rice for the egg and pasta for the caterpillar, chrysalis, and butterfly. I gave each child three green pom-poms and a spring-type clothespin. We glued the pom-poms in a line on the top of the clothespin and I glued the wiggly eyes on them. Viola! Caterpillars! Hung these from fishing line from the ceiling. The next day we took coffee filters and put drops of different colored food coloring all over them - hung these up to dry. We took our caterpillars and put them in toilet paper tubes and wrapped them up in yarn. Viola! Cocoons!! We read "The Very Hungry Caterpillar" by Eric Carle. That night when they went home, I cut open their cocoons, attached the "wings" (coffee filters) in the clipped part of the clothespin and put them back in the cocoons. When the boys came in the next morning and checked on their caterpillars, they discovered they'd turned into butterflies!! The two children I did this with are not quite two and they *loved* it!! 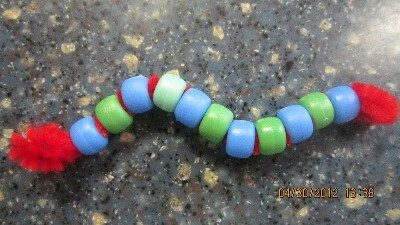 Use 1/2 of any color pipe cleaner, string on beads, and bend into caterpillar shape. Fold a piece of paper and have the children cut out a butterfly shape. Provide crayons and markers for children to use to decorate their butterfly wings. Children can also use glitter to make their butterflies sparkle Glue or tape two bent pipe cleaners to the back of the butterfly to make antennae. Cut out a butterfly shape fold it in the center, have the children paint on the side. Fold and rub lightly, then unfold. The sides will be identical. Fold a piece of construction paper in half from top to bottom and cut out the shape of a butterfly. cut out the center of the wings on both sides to make frames. Cut clear contact paper (or wax paper with glue) to cover the hole in each wing. Now you have sticky space for a wing . Give the children colored tissue paper to put on the sticky part. Have children take off shoes, dip feet into a shallow pan of pastel paint. Step onto a piece of paper so feet are going outward from the heels together. When dry, add antennae with markers. Fill the snack size ziplock bags with scraps of tissue paper and cellophane and then gather them in the middle with a half of a chenille stem. Twist and bend the stem into antennae. Using a vegetable peeler (or an old cheese grater) shave crayons into small thin pieces. Place a sheet of wax paper onto newspaper and sprinkle with crayon bits. Place another sheet of wax paper on top and press with a warm iron for a few seconds. Cut into a butterfly shape and hang in a window. Cut butterfly shapes from white construction paper. Set out assorted colors of 1-inch tissue paper squares, small containers of water and paintbrushes. Have the children paint the butterfly shapes with glue and water (mixed) and place the tissue paper squares randomly on the butterfly shapes. These are absolutely beautiful! Have the children remove their shoes and socks. Allow one child at a time to dip a foot into paint (Any color) and step down into the middle of a large piece of paper. Have the child step into a tub of water to rinse his foot. Then have the child paint their hand by brush, using maybe one color for two fingers, one color for the palm, etc. Just to receive colorful wings. Have the child make a set of handprints on each side of the footprint. Have the child then wash and dry hands. When the paint is dry cut around the prints by an inch or two in the outline of a butterfly. For finishing touches add wiggly eyes and pipe cleaners for antennae. Fold a sheet of light colored paper in half. Show the children how to paint on only one side of the paper. The paper can be folded again and pressed. The result will be asymmetrical painting. Antennas can be added to make butterflies using crayons or markers. Go to Page 2 of Caterpillar & Butterfly Theme!